A Japanese court has given two Greenpeace anti-whaling activists one-year suspended jail sentences for stealing a box of whale meat in 2008. They admit taking the box but say they were trying to expose corrupt practices in Japan's whaling programme, which the country insists is purely scientific. Commercial whaling is banned worldwide. Greenpeace says the sentences were "wholly disproportionate" as the defendants had acted "in the public interest and not for personal gain". The activists, Junichi Sato, 33, and Toru Suzuki, 43, were found guilty of theft and trespass by the Aomori district court on Monday. They said they had been contacted by a whistleblower on board a state-sponsored whaling ship where crew members were illegally receiving boxes of whale meat. 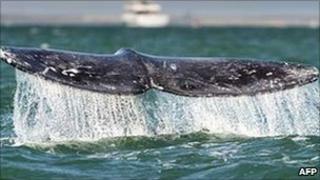 Commercial whaling has been banned since 1986. But Japan has continued to hunt whales as scientific research - while not hiding the fact that whale meat ends up in restaurants and shops.